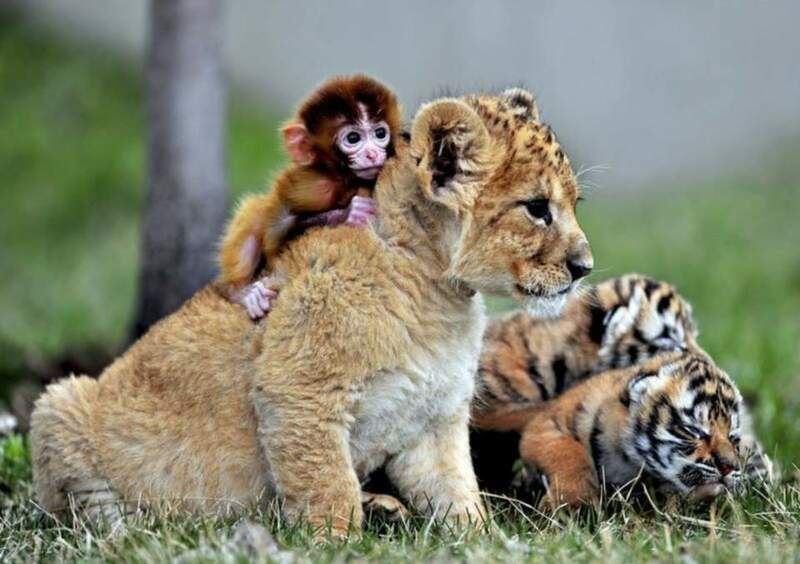 A baby monkey playing with a lion cub at Guaipo Manchurian Tiger Park in Shenyang, China. There are also two cute tiger cubs playing with each other in the background. Shenyang is the capital and largest city of Liaoning Province, as well as the most populous city in Northeast China by urban population. The city serves as the transportation and commercial hub of China’s northeast—particularly with Japan, Russia, and Korea. There’s a Manchurian Tiger Park in Shenyang. The photo above is from April 19, 2013. The 16-day-old monkey and the 32-day-old lion cub have become intimate friends, and they like spending time and playing with each other. They are both fed by keepers after birth as their mothers lack breast milk.